Summer time is finally here! Summer trampoline games using the hose are a great way to have the kids out actively enjoying the great weather while still staying cool. We love playing these cooling games with our kids. 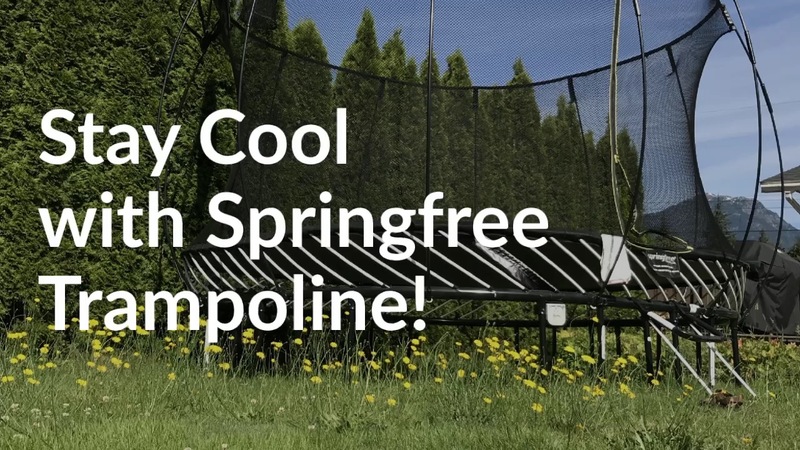 Springfree Trampoline is the perfect backyard playground all year long. Did you know that Springfree has recently received 2 independent safety ratings for the safest trampoline? Our team had a blast coming up with 5 simple games for the kids (and adults) to play. Don’t forget to apply sunscreen before and re-apply during any outside activities. Have fun! 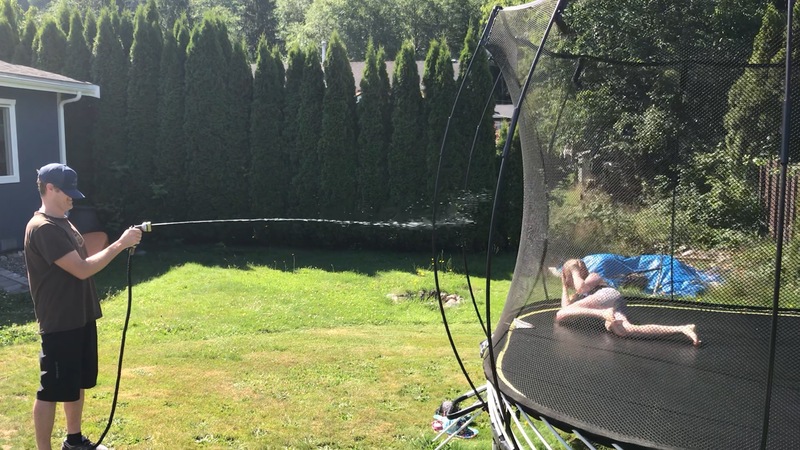 Player 1 holds the hose & stands off the trampoline with their eyes closed. Set the hose to “JET”. 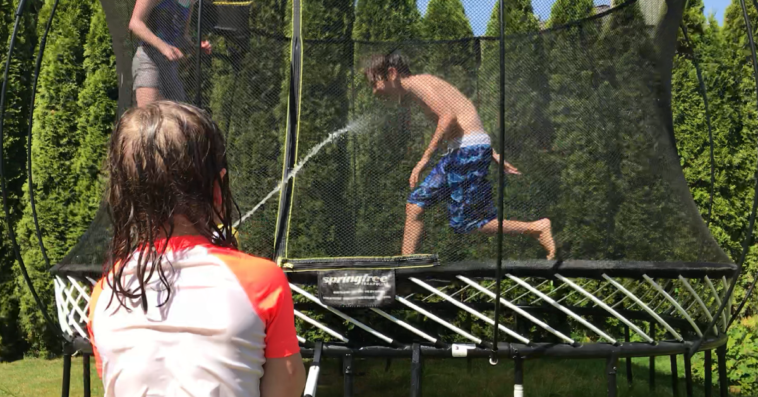 Players on the trampoline try and avoid being tagged by the jet of water. 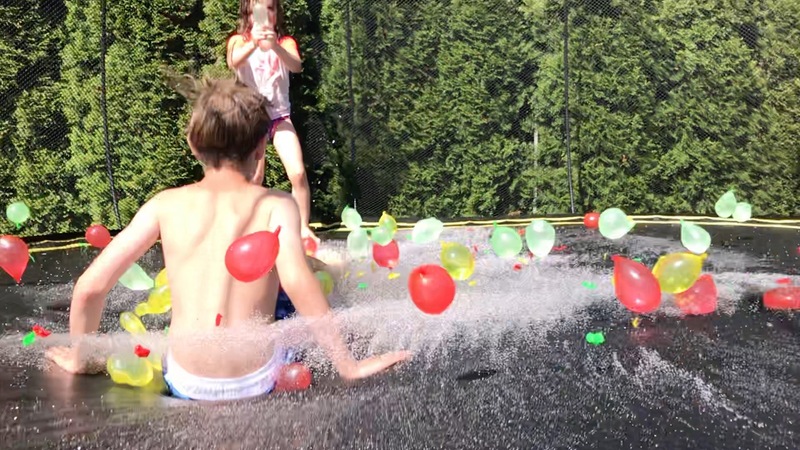 Fill water balloons and place on the trampoline… stand back and let the fun happen! To avoid any potential ankle injuries, remind kids to be mindful of not landing on the balloons on their feet.. that’s what bottoms are for. Player 1 holds the hose & stands off the trampoline. Set the hose to “JET” & hold the water stream steady. Player 1 calls out whether the other players need to go OVER or UNDER the water. Player 1 holds the hose & stands off the trampoline. Set the hose to “JET” & hold the water stream steady. The other players try to go under the stream of water without being sprayed. Player 1 brings the height of the water down by a few inches after each pass. Set your hose on “MIST” and trap the sprayer in the corner of the trampoline zipper. Since the mist setting disperses such small water droplets, the sunshine will produce a rainbow. This also allows the kids to stay cool without getting too cold from the water. Looking for more trampoline games? Let our team of kids tell you their 6 favourites. 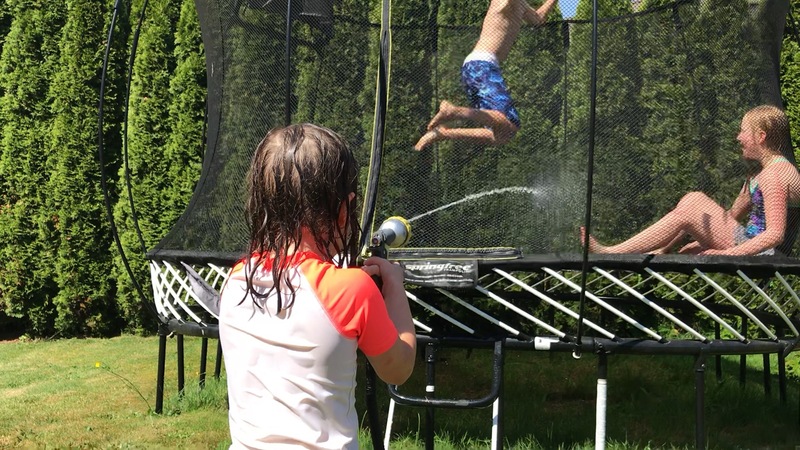 35 Summer Fun Ideas To Keep Kids Busy 50+ Low Cost & Free Summer Activities in Metro Vancouver Kid-Approved Trampoline Games! Love all the fun games. Can’t be staying cool with water and fun!! Waterballoon fights,water guns, river swims and water parks are how were beating the heat this summer! Love spending time down at the lake. Great suggestions for trampoline fun and staying cool. Since we don’t own our trampoline anymore we head to our local outdoor pool or beach for summer time cooling off. We love going to the beach and cooling off in the ocean!! WE love water balloons. Combining that with the trampoline is such a GENIUS idea! Beaches help beat the heat! We live the spray parks! Freezies and slip n slide! Our family beats the heat in anything with water! We go to Waterslides, water parks, the lakes, ocean anything with water, we enjoy boating. IF we decide to do indoor things we make sure their is air conditioning it’s important for the kids to be nice and cool. So far we played at the beach, lake and swimming there also swim at the pool. We are planning for water baloon fight. Water gun fight and bringout the ring pool. Also ice cream and popsicle lol. We zap strapped a sprinkle hose to the top of the netting so we have continual misting while jumping on the trampoline! Excellent on a hot summer day. All of these are such fun ideas! Going to try these out. We Walk along by the lake and do a lot of water park !!! 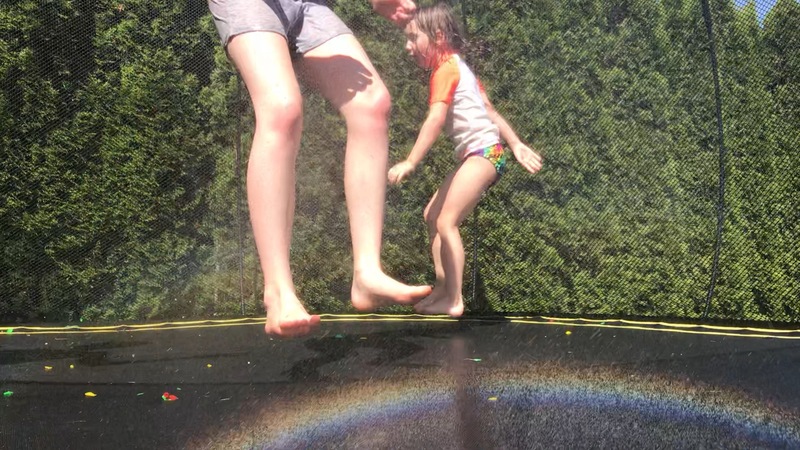 We put the sprinkler under the trampoline and have fun getting wet and jumping through the water! We beat the heat by frequenting water parks!! We put the sprinkler under the trampoline!!! Ours has a hole in it. In the backyard swimming pool!! Water balloon fights, sitting in the kiddie pool or washing my car (win, win!). Loved having a trampoline growing up. We would put the hose on and a little dish soap. 😊 Only had 2 sprained toes from it! Love the game ideas, my kids have always asked for a Trampoline so that we can turn on the sprinkler on hot days and play outside! We stay cool by keeping hydrated, having cool treats, and playing in the backyard. Lots of popsicles and pool time! Those games are all actually petty great! We don’t have a yard for water games (😣) but I take the kids to the waterpark or the river near us all the time. Or we go to indoor play places like the one at McDonald’s because they have a/c. We go to pool a lot and stay in the water long time. Just got our Springfree trampoline so we will definitely have fun trying these games! Our family loves using a little kiddie pool, playing in the sprinkler or heading to our local river, pools and watersides each summer to cool down. Yesterday we were beating the heat by having a wading pool out and then the kids decided to soak the trampoline and do a ‘slip and slide’ style game on it. Sprinkler under trampoline is lots of fun!! Mini water balloons on the mat to jump around in are always a hit! Hanging out in the pool or hitting the lakes, oceans or rivers for a swim! Slip and Slide for fun and exercise! We like to get the water out in the backyard or visit a local water park. Fun and easy! so far, we have spend 2 weeks camping at a couple of different lakes. At home we have water squirters & make our own fruity popsicles. WE beat the heat by going to the lake or pools. Love having cold treats also!! Sprinklers, water guns and freezies! We beat the heat by going for a walk down to the river under the shady trees. My baby put his feet in the local fountain with some other kids. Did he ever enjoy the cool water. We always beat the heat with a trip to the water park in the evening or going to the local pool. Air conditioning or water balloons!